On the last day of March, DC Mayor Muriel Bowser held her "state of the district" address. Outside were scores of DC residents excluded from the event-and apparently excluded from the Mayor's promises about affordable housing. There was even talk of housing that someone with a $75,000 a year income can afford being defined as "affordable." 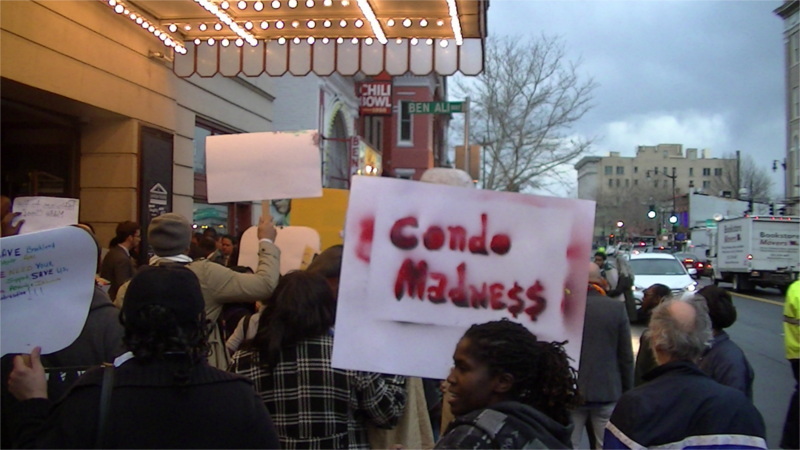 The "Real State of the District" protesters beseiged the Lincoln Theater where the Mayor was speaking and at one point took to the streets to blockade 13th and U sts. A key slogan was "Black Homes Matter!" Yes, there are still Critical Mass bike rides in DC. This one was on March 27th 2015, departing Dupont Circle shortly after 8PM. 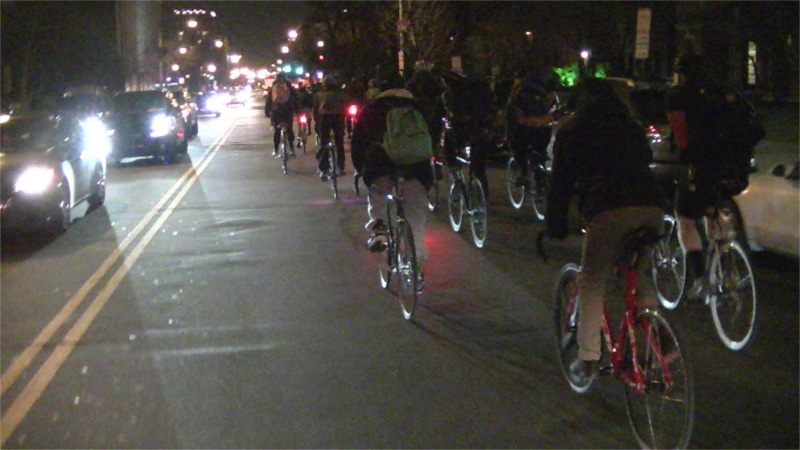 Critical Mass in DC meets at Dupont Circle at 8PM on the last Friday of each month. by Eddie Becker White House Demonstrators demand an end to caste, gender and racial discrimination and for the promotion of universal Dalit Rights. https://www.youtube.com/watch?v=etrFYFSnXx4 "India's caste system assigns individuals a certain hierarchical status according to Hindu beliefs. Traditionally, there are four principal castes (divided into many sub-categories) and one category of people who fall outside the caste system—the Dalits. On the 26th of March, Members of the #Ayotzi43DC protested in front of the US Dept of State demanding a cutoff of US funds to Mexican military units involved in human rights violations. 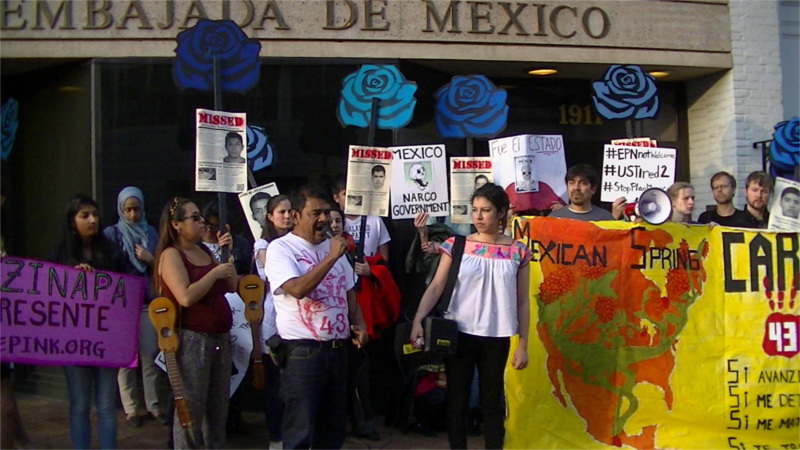 The rally was followed by a march on the Mexican Embassy. Six months ago to the day, Mexican police and military opened fire on a bus carrying 43 teaching students in Ayotzinapa and they have not been seen since. It is widely suspected that after police ambushed and fired on their bus the survivers were turned over to cartel gunmen to be killed and there is evidence their bodies may have been incinerated. The Shortwave Report 03/27/15 Listen Globally! Read more about The Shortwave Report 03/27/15 Listen Globally! More than six months after Michael Brown was killed by Officer Darren Wilson, the youth-led protests in Ferguson continue to fuel a national movement against police brutality. “Part of the struggle for us in Ferguson is to break a four-hundred-year belief that black people are not human,” says St. Louis native and activist Rev. Osagyefo Sekou. On the 24th of March, Sen Wyden, leading Democrat of the Senate Finance Committee, had scheduled a fundraiser at the Bistro Bis restaurant in the same building as the Hotel George. The fundraiser was cancelled after he got word that protesters against his support for "fast-track," no amendment voting on the proposed TPP trade deal were also going to be there. Protesters showed up anyway as a precaution against being faked out and to educate passers by on the bribery that takes place at these fundraisers. 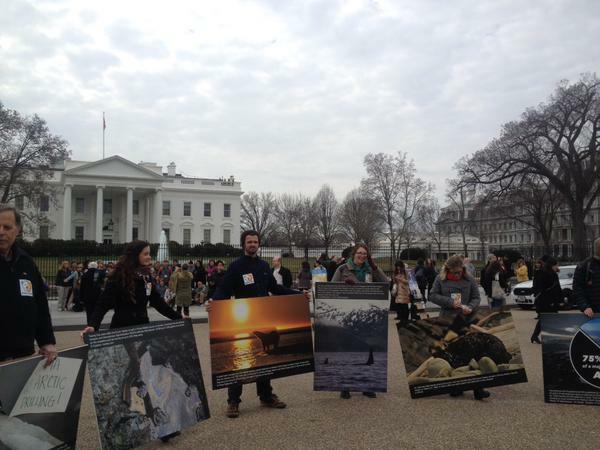 On the 24th of March, Greenpeace staged a protest in front of the White House to demand that Obama reject any expansion of oil drilling in the Arctic. This protest was held as Obama's decision could now come at any time. Like the Keystone KX, this decision pits the survival of Indigenous people and untold numbers of animal species against the profits of hugely rich multinational oil companies. On March 19, animal rights protesters gathered in front of the DC Verizon Center to launch a weekend of protests against abusive treatment of animals by the Ringling Brothers Circus. 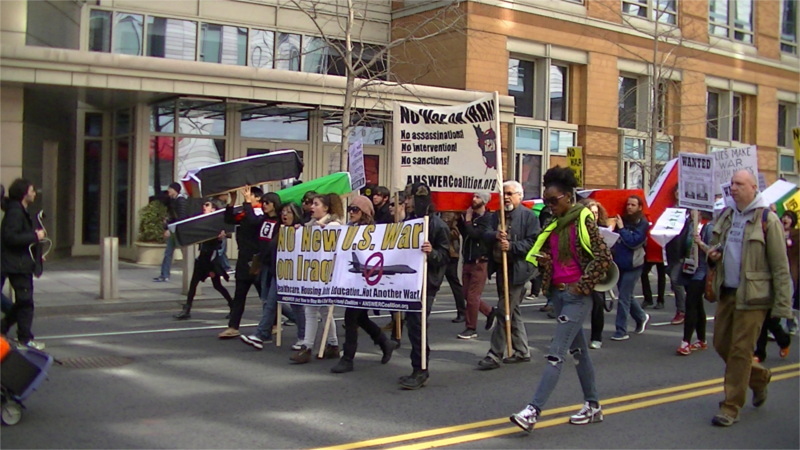 On the 21st of March, a large antiwar march carried coffins draped with Iraqi flags symbolizing those killed to date in US wars in Iraq and elsewhere in the Middle East. Specific demands were that the US not return to Iraq, nor launch a new war against Iran. 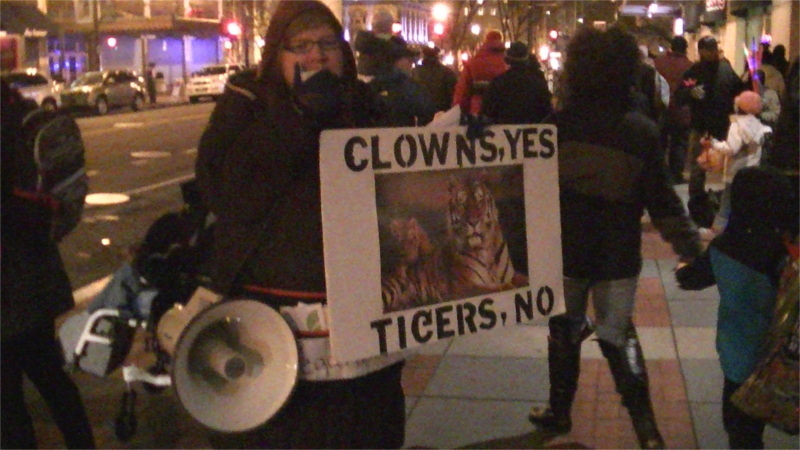 On the 20th of March, animal rights protesters showed up for the second night in a row outside a DC performance of Ringling Brothers and Barnum Bailey circus. On the 21st of March even more protesters were present throughout the daytime performance of the circus One of the protesters on March 20th was a former elephant trainer displaying a real bullhook, the instrument used to beat the elephants into submission. Ringlings has announced they will retire the elepant acts, but not all the other animals such as tigers. 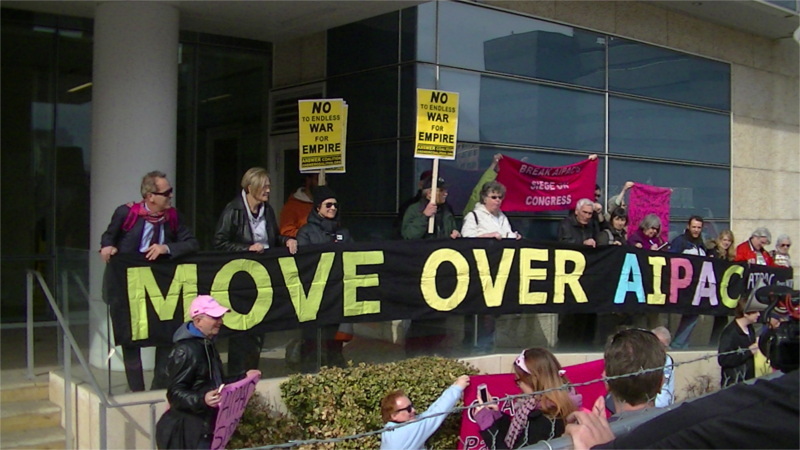 The 19th of March marked the 12th anniversary of the first day of George W Bush's invasion. The day the war began, protesters in DC blocked Key Bridge in a combined foot-bike operation. There have been protests on that day most years since, and 2015 was no exception. 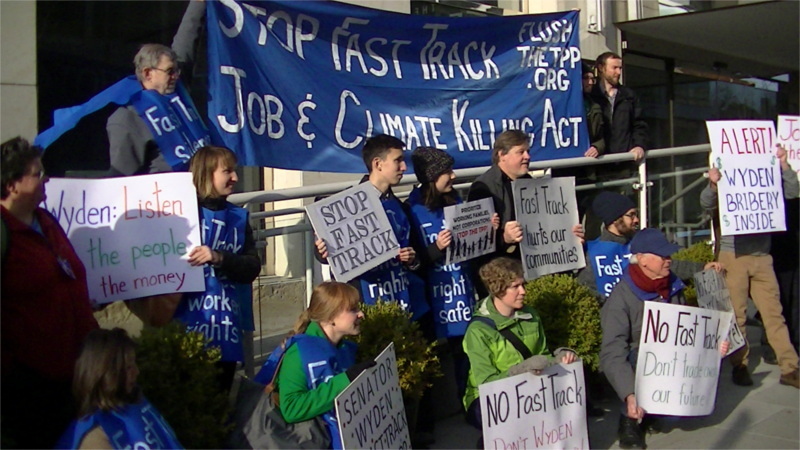 With war and dirty trade deals again leading threats, protests popped up all over DC. One of them,the "Spring Rising" bus tour of warmongers, ran into significant police harassment at the Pentagon.